It’s hard enough to pay rent here without having to shell out $150 for a massage, but sometimes you need someone to beat the hell out of your shoulder blades, lest you crumple over your computer and die before you finish your Best Spa guide. These are our favorite spas in the city, may they be fancy, shvitzy, or downright clinical—leave yours in the comments. OHM SPA: The friendly technicians at the zen spot perform the full gamut of services to perfection, from paraffin wax nail care to exfoliating facials to glorious custom massages. Recently, they moved to bigger digs on the 5th floor of their old building, offering more space for ultimate relaxation, though they’ve managed to preserve the old spa’s intimate feel. Prime treatments include the hot stone massage ($175/hour), the deep Swedish massage ($155) and their specialty Manuka honey facial ($175); just be sure to book well in advance, as spots can fill up. 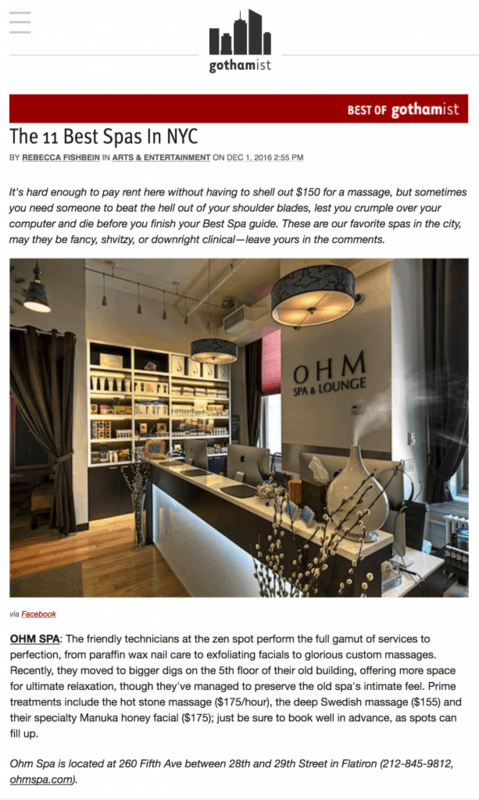 Ohm Spa is located at 260 Fifth Ave between 28th and 29th Street in Flatiron (212-845-9812, ohmspa.com).